With Lent beginning this Wednesday, it seemed to me that we should continue our tradition of putting before our readers some considerations for possible Lenten observances. Lent is traditionally a time of fast and abstinence. Evidently, the obligations surrounding this have been much relaxed in the West in the past few decades, but the relaxing of the obligation does not mean there is not value in still opting to pursue these practices. Indeed, there is nothing (outside of health and age) to prevent one from taking up the practice of devotional fasts and abstinence. A common and popular form of Lenten abstinence is abstaining from some particular food you enjoy for the duration of Lent -- a worthwhile practice. In addition to this, there are further manifestations we could consider, particularly as it relates to fasting. For example, one could avoid snacking between meals during the duration of Lent, or one might opt to take on the full rigour of the traditional Lenten fast and abstinence discipline as it stood before the latter 1960's. At very least, the Lenten Ember days might provide a good opportunity to observe the fast and abstinence discipline associated with them. We have mentioned these three pursuits more than enough over the years that I do not think we need to get into any significant explanation of why any of these would be particularly worthwhile to pick up as part of your Lenten exercises -- and hopefully beyond. But let us summarize. The Divine Office provides a particularly good way -- a liturgical way -- of joining oneself to the rhythm and progression of the season of Lent. One prays with the Church's voice, with the proper of the season that the Church presents to us, and with the psalms, canticles and the scriptures generally. Many have expressed a desire to pick up this particular habit of prayer, while others have personally commented on its immense spiritual value in their lives; Lent is a good time to begin to establish this daily routine. Lectio Divina, or the slow, prayerful, meditative reading of the Sacred Scripture, is defined by four aspects: lectio (the slow reading of some passages of sacred scripture); meditatio (meditating on what has been read); oratio (prayer to God); and contemplatio (the silent adoration and contemplation of the presence of God). Pope Benedict XVI has commented in the past that he believes this practice has the potential to bring to the Church "a new spiritual springtime". The Roman Martyrology presents to us the heroic acts and sufferings of the Christian martyrs, which is certainly pertinent as we bring to mind the Passion of Christ. While Lectio Divina or the reading of Sacred Scripture generally, should be of particular consideration for us in the area of spiritual reading, evidently there are other spiritual writings which are certainly of merit as well. First, in keeping with a liturgical theme, readers may like to consider Dom Prosper Gueranger's writings for Lent. Fr. 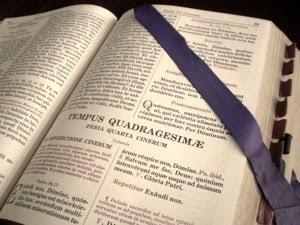 Brian Jerabek has also put together a number of different Lenten reading plans which are freely available online, including one for daily readings with the Church Fathers. Last year, each day we took readers through the different stational churches of Rome. You are certainly welcome to re-read those entries, but in addition, its not yet too late to pick up a copy of The Stational Churches of Rome, written by Fr. Frank Phillips of the Canons Regular of St. John Cantius. This is not intended to be an exhaustive listing of course, but I hope it might prove a spark for some of you as you sit down to consider what you might pursue this Lent.